I learned a very curious fact. We have two Christian saints St. Thekla and St. Isidore of Seville which are protectors of Computing and people involved with computational sciences programming and IT related jobs. The two saints both lived before the Great Church Schism thus the saints are celebrated and venerated nowadays in Roman Catholic Church and Eastern Orthodox Churches all around the Christian world. The reason why Saint Thecla is considered a protector of all people who heavily work with computers and possibly hackers 🙂 is her name, Tecla means "Key" (a keyboard one) in Spanish. Besides that everyone knows Keys (Passwords) and codes – a sort of keys as well as keys in programming arrays are widely used in Informatics and are essential part of computer basic Software. 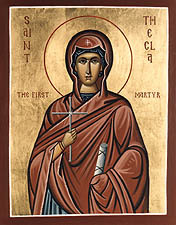 Saint Thecla is considered a direct pupil of Saint Apostle Paul as she turned to be preacher of Christianity after speaking saint Apostle Paul. She lived in 30 A.D. until 1-st century after Christ. St. Thecla was virgin and decided not to mary even though she had fiancee in moment where she heard the Gospel of Christ. She was miraculously saved from being burned at a stake by the onset of a storm, and traveled with Paul to Pisiduan Antioch. There a nobleman named Alexander desired Thecla and attempted to take her by force. Thecla fought him off, assaulting him in the process, and was put on trial for assaulting a nobleman. She was sentenced to be eaten by wild beasts (a common punishment for Christians in 1st century). Again saved by a series of miracles when the female beasts protected her against her male aggressors. 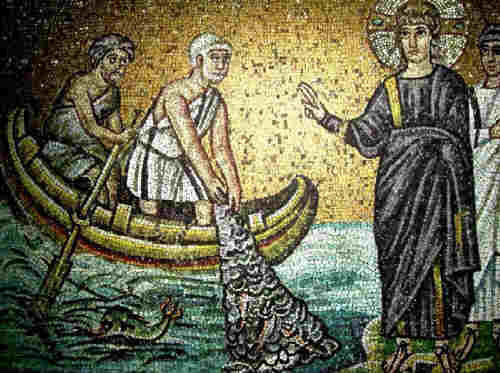 She sought out St. Paul and his companions, including St. Barnabas, who were hiding in a cave near the city. She spread the gospel of Christ with them in Antioch, and throughout her life performed many miraculous feats and suffered many tortures to give glory to God. Having retired to a desolate region of Isaurian Seleucia with the blessing of St. Paul, Thekla continued to preach God's word and heal st. Paul's spiritual children. She lived to venerable old age of 90. Even in this old age envious pagan sorcerors come with the intention to defile the holy virgin. . A large rock split open when St. Thekla called on Christ the Savior to help her, and the rock covered her, and she offered up her soul to the Lord. St. Thecla is highly venerated by Nuns an interesting fact is during tonsure of nuns in the Orthodox Church, her prayerful intercession for the tonsured nun is invoked. Hymns Troparion (Tone 4)  You were enlightened by the words of Paul, O Bride of God, Thekla, And your faith was confirmed by Peter, O Chosen One of God. You became the first sufferer and martyr among women, By entering into the flames as into a place of gladness. For when you accepted the Cross of Christ, The demonic powers were frightened away. O all-praised One, intercede before Christ God that our souls may be saved. 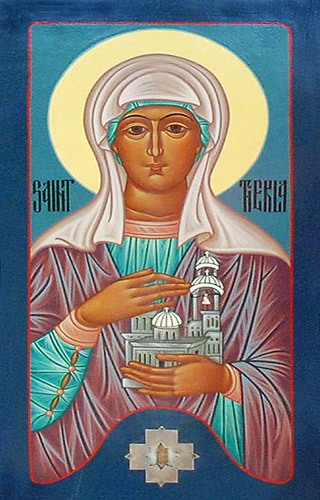 Kontakion (Tone 8) O glorious Thekla, virginity was your splendor, The crown of martyrdom your adornment and the faith you trust! You turned a burning fire into refreshing dew, And with your prayers appeased pagan fury, O First Woman Martyr! His books are among the first attempts to create universal catalog of available information in the World. His writtings are a sort of ancient Wikipedia. Even to this age his books provide us with many information and instruction on Church dogmatics and life as understood from a Christian view. 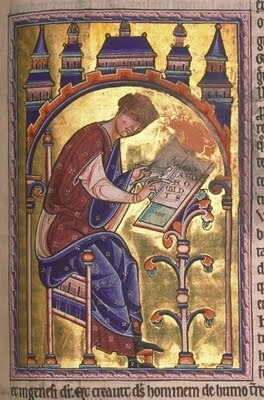 Saint Isidore's most notable work is Etymologiae – which is among the first encyclopedias worldwide – a huge compilation of 448 chapters in 20 volumes. 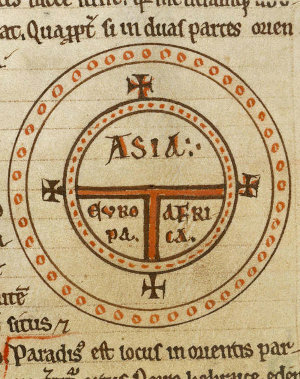 Contrary to many critics of Christian faith claiming that the Holy Fathers or the Church teach the earth is square shaped and one can reach the end of the world in St. Isidore's work, it is clearly explained that the earth has a circle like form. According to some sources, saint Isidore is said to be the most learned man of his age. 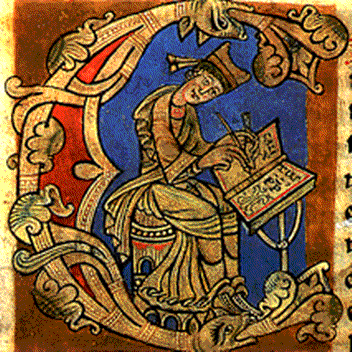 His works played key role on development of Middle-ages educational life. It is curious fact that in year 2000, the Vatican proclaimed Saint Isidore as patron saint of the Internet. In Orthodox Church, we're not the authority of the Vatican Pope, so for us Orthodox Saint Isidore is not patron saint of Internet, however his contribution for increase of worldly knowledge as we know it today is un-questinable. His Holy relics are currently held in Roman Catholic Cathedral in Murcia (Spain), so any Orthodox Christian who is in deep involvement IT who travels to their or happen to live their might drop by to venerate the saint. St. Isidore's episcopate was during a time of disintegration and transition as the ancient institutions and knowledge of the Roman Empire were disappearing. During these times, he set himself to the task of joining into a homogeneous nation the many peoples who made up the Gothic kingdom. To accomplish this task he used all the resources of religion and education available to him. 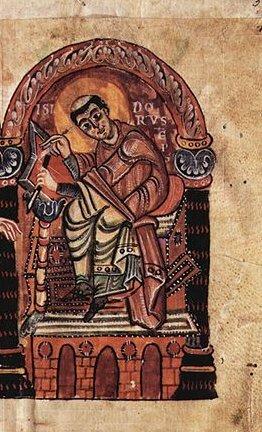 He presided over the Second Council of Seville in November 619, leading to the setting forth of the nature of Christ in the Acts of the council, as he pushed for the eradication of Arianism. There is a miracle of incorruptable holy relics (Incorruptable Bodies) of many of our Orthodox Saints in the Orthodox Church. Little or none is actually known in the non-orthodox christian realm about this great miracle proof of the truthfulness of our faith. The incorruptability of saints has been a phenomena longly known to exist, some of the incorruptable bodies of saints are still preserved already for more than 10 centuries. The phenomenon of incorruptable bodies is a sure sign for saintship in the Church. There are dozens of orthodox christian saints whose bodies are still intact. Our Orthodox Church teaches that the incorruptability of the saints body is given by God’s grace for all us the believers as a confirmation of the Resurrection of the Dead, which is about to come in the Great day of the Lord as the scriptures teaches. A good example for incorruptable body which exists for 10 centuries in the bulgarian lands are the incorruptable holy body of St. John of Rila. St. John of Rila is the greatest known Bulgarian saint also officially recognized by the Bulgarian Orthodox Church as the patron saint of Bulgaria (protector of all Bulgaria). Antiphon translated to English means (Song of Praise) dedicated to some Christian saint and is actually an Orthodox well-known Church term. Saint John’s incorruptable bodies is still kept in his established monastery The Rila Monastery . Each year on the saints feast his incorruptable body is being bringed out of the monastery for a procession around the Church monastery. 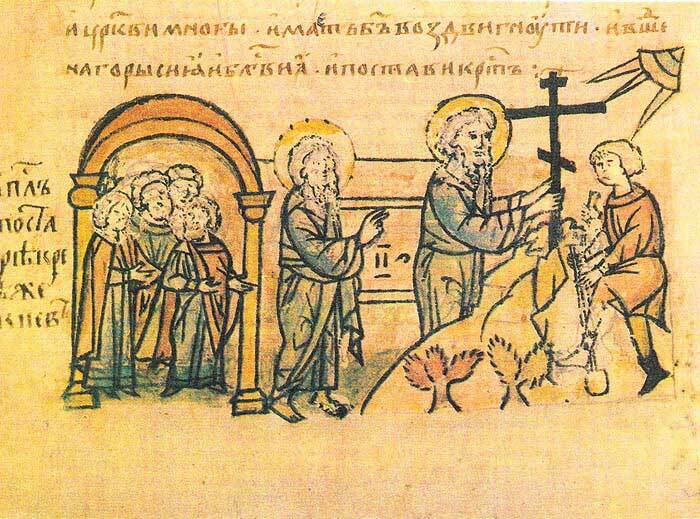 On that day all the pilgrims who are looking for St. John’s spiritual intercession in front of God (The Holy Trinity) are lined up to venerate the great God servant St. John of Rila. Unfortunately there is no video that has video-taped the incorruptable body of Saint John of Rila. However there are plenty of videos which shows a lot of incorruptable bodies of saints some of which are even Roman Catholic. Along with the saints bodies incorruptability, many of the saints bodies does emit a specific a flower like odor, nevertheless the body is a thousands of years old. Here is an example of a saints remains which is considered incorruptable, his body is preseved for more than 60 years without any special chemical threatment. What is most important is many believers does receive a spiritual blessing or get healed from various spiritual or bodily diseases, when they look up for the holy intercession of the saint, who has been honoured by God with incorruptableness. Before a saint’s body is recognized as a saint and his body as incorruptable, usually there are testimonials by christian layman for healings by his holy prayers during his earthly living. Some of the saints which are found to have incorruptable bodies has happened after a few years they have been put in a normal earthly grave. In holy mount athos there is a tradition that (if I remember correctly 5 years) after a monk’s death and burial, his grave is being digged out to collect his remains and put it in a ossuary. After this 5 years some of the holy monks remains are found to possess this miraculous graceful incorruptable bodies. As we know from Holy Bible, the body is the temple of the holy spirit my logical interpretation of some of the saint’s incrorruptability is rooted in there saint’s way of living as they have achieved the Holy Spirit (The Spirit of God) in an immeasurable quantities that, the Spirit of Truth that’s being flowing out from their incorruptable bodies is still sustaining the body and prevents the natural laws to destroy it. The bodily incorruptabilities of our Orthodox saints is also a clear sign for the truthfulness of Orthodox Christian faith. The incorruptability is also a direct violation of the natural laws by God’s great providence and mercy and I guess is given as a stimulator of us whose faith in our saviour Jesus Christ and in God the Holy Trinity – The Father, The Son and The Holy Spirit, to whom be glory now and forever and ever Amen! Saintship has been slowly disappearing from earth just like it's prophecised by Christ our Saviour and the Holy Apostles and in later times by many monks, Church hierarchs, patriarchs and hermits. In Bulgaria as in most parts of the Orthodox world the Christian faith apostacy is also clearly seen. Even in this dark days God still shows mercy to us and still present us some of his saints. Elder Dobri of Baylova has been a regular person like all of us with a family and children just until 12 years ago. About 12 years ago the I would call him The Living saint has decided to let all the earthly passions and sorrows for Christ and his eternal salvation. He despised the earthly goodness and become a beggar, all the collected money he got were distributed among other poor people or donated to Churches and monasteries belonging to the Bulgarian Orthodox Church. Day by day and a coin by coin, he has collected thousands of levs (the bulgaria national currency). As all the truths his sayings are simple but represent the ultimate truth which was also said in many other forms in The Holy Bible Gospels and God's law. The external outlook of Dqdo Dobri is also saintly, he has long beard a shining eyes and a national folklore dress. He looks like he has been out of some old Bulgarian tale. It's very striking fact that he that this old man is the biggest donator for our Cathedral Temple, we have many millionaires and businessman in Bulgaria but nobody has decided to donate to our Church such a high sum of money. Elder Dobri's donation for the St. Alexander Nevski's Church is in value 35700 levs (around 19000 euros). 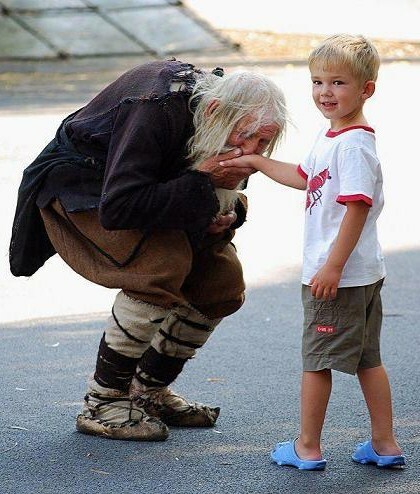 Dqdo Dobri is a beggar for Christ, this is one of the major types of saintship we read about in the living of the saints. All the collected money from people are given for God's Glory. It's amazing heroism and an example, all we the Christians should follow to fulfill Christ's law of love and inherit the internal salvation. A friend of mine who has the blessing to see Elder Dobri with her own eyes and have a small talk with him, has shared with me that even though he wears an old ragged clothes, his clothes and body emit a roses like odor! As the fame about the same has grown these days, the Bulgarian National television has prepared a small video about the saint. I believe the video as a true blessing for us the Christians and will encourage us to persist in the good deads.